We began by concentrating on High Voltage Switchgear, Rail Product and Oil and Gas industries. Realising from an early stage that many companies were using the term "One Stop Shop" but failing to deliver on that statement. We decided to provide an all encompassing service that would offer as much as possible without losing control of the product in manufacture. 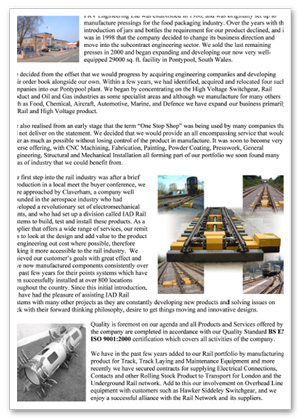 Our first step into the rail industry was when we were approached by Claverham who had developed a revolutionary set of electromechanical points and our remit was to look at the design and add value to the product by engineering out cost where possible in order to make it more accessible to the rail indutry. We achieved our customer's goals with great effect and have now manufactured components consistently for the past few years for thier points systems which have been successfully installed at over 800 locations. Since then we have added to our Rail potfolio by manufacturing for Track, Track laying and Maintenance Equipment and more recently we have secured contracts for supplying Electrical Connections, Contacts and other Rolling Stock Product to Transport for London and the Underground Rail Network. Add to this our involvement on Overhead Line equipment with customrs such as Hawker Siddeley Switchgear, and we enjoy a successful alliance with the Rail Network and its suppliers. Click here to download our full brief on the Railway Industry.